How do you do an indoor winter market? Not by importing produce from sunnier climes! In January, local producers have root vegetables, nuts, eggs, poultry, cheese, meat, baked goods, honey, and other products. And soon the local greenhouses will provide flowers, early vegetables, and vegetable starts. Winter markets are apparently still unusual, but they can probably be duplicated anywhere. Ours gets positively mobbed! The Corvallis Indoo r Winter Market runs every Saturday from 9:00 AM to 1:00 PM from January 14 through April 8. All of these are fine books (I only publish books I believe in). If you’re like most readers of this newsletter, you’ll enjoy starting with Fresh- Air Poultry Houses and Success With Baby Chicks. These cover the basics of healthy, odor-free, high-quality chicken housing and zero-mortality chick brooding, respectively, and get good reviews. Decide what records to keep during the coming year. 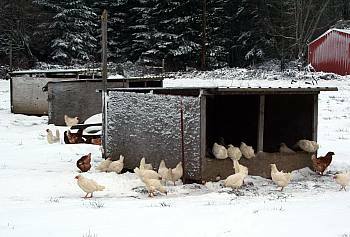 My name is Dave, my wife and I are starting a small poultry farm and have read your books and your blog. Thank you for sharing! I am putting together some projections and wonder if you would mind looking at the numbers and see if they seem realistic? We’re looking at .36-.40 cents for eggs cartons. Any thoughts on reusing cartons? Health issues or insurance issues? This is all separate from infrastructure set up, but am I missing anything? We’re figuring 375 eggs per hen over 18 month laying period. Considering some lighting in winter. I saw you mentioned privett Hatchery about the slow growing meat birds. Have you delt with them? I have had a hard time getting and solid info from them, and mostly get grief. There are also alot of bad reviews. We might need to deal with them to sell at our farmers market. Let’s see … you’re close to what I’d guess. My rule of thumb is 100 pounds of feed per hen per year. That’s 0.274 pounds of feed per day. You estimated 0.25. You’re estimating $2.50 per chick. Privett Hatchery’s rate for pullets of the breeds we buy is $2.55 if you buy them by the hundred, as we do. You estimated $2.50. Your egg carton rate seems about right based on the last rates I remember. A lot depends on shipping costs. Used cartons are great when selling face-to-face. If customers are shopping in a grocery store, they won’t buy things in shopworn packaging. Thus, the eggs we send to stores are in new cartons, and the ones we sell at farmer’s markets are (often) in used cartons. Customers love to offload their cartons on us, so we have a never-ending supply. (Don’t inspect the cartons in their presence; say “thank you” and discard the dirty/stained/worn out ones later.) Oregon specifically allows used cartons. Some states don’t. We buy from Privett all the time. On the whole, when dealing with hatcheries, ask to talk to the hatchery manager with real questions: the people answering the phones often don’t know much. I can’t recommend anyone’s slow-growing broilers. We’ve tried it several ways, and we’ve always lost our shirt. What little market there is for tough, undersized chickens is better served by spent hens!